This month our trip along The Spice Trail takes us to the Land of Ginger. But our destination could be just about anywhere on the planet. From gingerbread men to ginger beer, from curries to cakes, ginger is an ingredient used the whole world over. And that’s precisely why I am so excited about seeing your ginger-inspired dishes, as who knows what you might come up with. Zingiber officinale is a rhizome that was indigenous to South East Asia before the Chinese made it world-wide popular. A natural remedy, specifically for warding off colds, most of the power is concentrated in the outermost 2mm, so best not to peel, just give it a good wash and as long as it’s good and fresh you can grate it just like that. Elizabeth David used to swear by keeping it in foil in the fridge but I think our supply and fridges are better these days. Ferocious in its intensity, historically ginger has been used in many ways, both medicinal and culinary, savoury and sweet. A vital part of all Asian cooking, it was being ground and transported to Europe by the Romans, but more for health reasons. It wasn’t for about another 1,000 years that it started to be used in cookery, but then things really took off (candied ginger became a favourite ingredient in medieval England.) Good for dodgy tums, as well as clearing the paths and passages in your body. But what I really want to know is, what’s your favourite way to cook with ginger? This month’s winner of The Spice Trail challenge will be lucky enough to receive a gorgeous set of six Pantry Design spice tins, thanks to the kind people at Dotcomgiftshop. Dotcomgiftshop is home to delightfully quirky, often kitsch but always stylish gifts. Designed and sourced by their in-house team, they offer a large range of stylish home accessories, as well as cute gifts to suit every personality. Whether you’re celebrating a birthday, planning a wedding, or simply want to treat yourself to something fabulous, you won’t fail to find what you’re looking for. With an eclectic mix of products, spread out across a simple to navigate website, it’s easy to find gift inspiration at Dotcomgiftshop. You may enter as many recipe links as you like, so long as they feature this month’s key ingredient, ginger. Send your recipe URL to me at vanesther-at-reescommunications-dot-co-dot-uk, including your own email address and the title of your recipe or post. The closing date this month is Friday 28 March 2014. At the end of the month a guest judge will choose a winning recipe and the winner this month will receive a set of spice tins from Dotcomgiftshop. 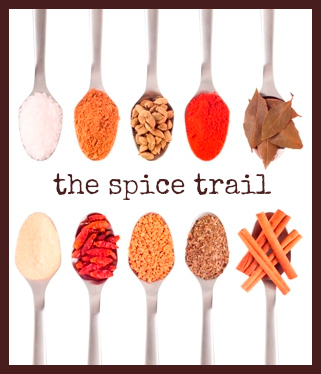 So what ginger goodies will you come up with for this month’s Spice Trail? Any questions, please tweet or email me. And thanks to everyone who entered February’s caraway challenge – you’ll find the round-up of recipes here. Ginger is one of my favourite spices so I’m looking forward to using it this month. I usually use it in something most weeks. I will send a post in for this event. Love ginger and those spice tins are just tooooooo cute. gosh, another challenge! I’ll try – I promise! I am soo bad at doing challenges, but as someone else said the tins look lovely! I love ginger so much!!! I just might have to throw my hat in the ring on this one. Must try to enter as I cook so often with ginger in its many forms. Adore it. One entry already but fingers crossed I should have another before the month’s out, LOVE ginger and it gets used pretty often round here! Hi Vanesther, i just sent you an email with my URL. I hope I’m not too late. I LOVE cooking with Ginger, that’s why I could not resist when you put up this challenge, but I only noticed this this week..